Browse: Home » Who is the “Concerned Citizen”? Who is the “Concerned Citizen”? On July 31, 1969, the Zodiac killer mailed three letters to three different San Francisco newspapers. 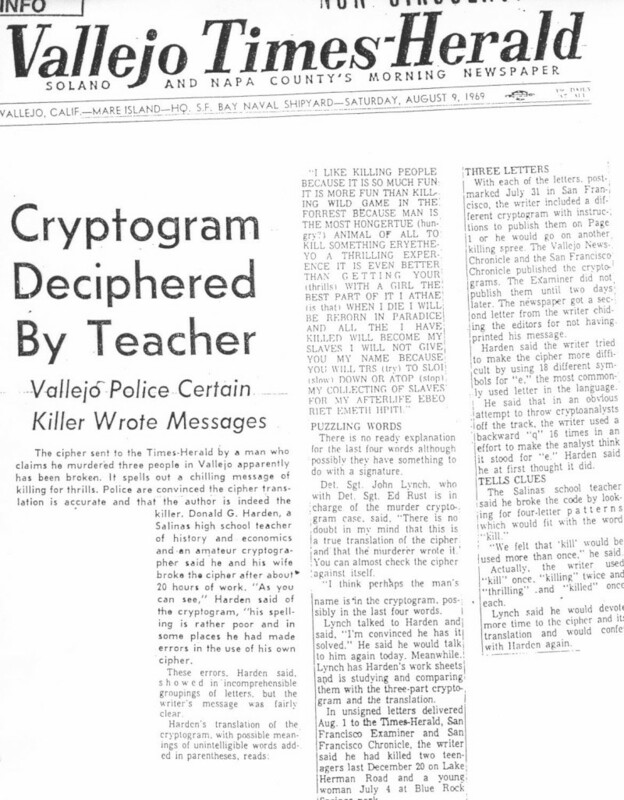 Each letter included details about his recent murders, and a third of his 408-character cryptogram. 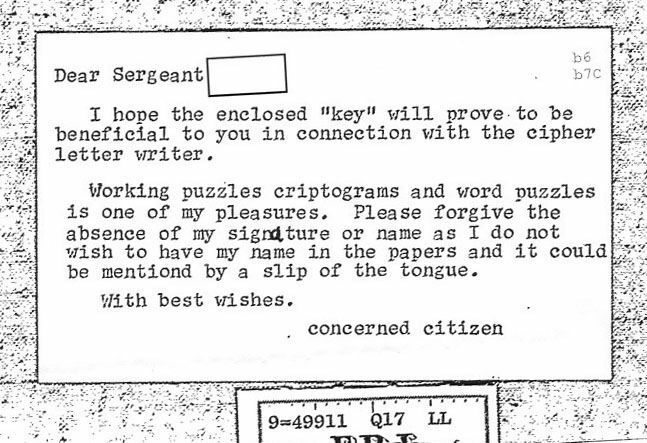 The pieces of the cryptogram were soon published, and in less than a week, Donald and Bettye Harden had already solved the cryptogram. Their solution was published in the San Francisco Chronicle on August 9, 1969. “I’m convinced he has it solved”, said Detective Sergeant John Lynch, who was in charge of the case at the time. But no one seems to know who sent the key. Was it from a person who read the Hardens’ solution in the Chronicle, and wanted to be helpful? Was it from the Hardens? Or was it from the Zodiac killer himself? Or maybe another clever solver, independently cracking the cipher around the same time by coincidence? Here, the author of the key is saying “the cipher text symbol Q is used to represent plain text letters F, K, L, and M.” There is a simple error here, because there are actually two Q symbols. The symbol is used for the plain text letter F, and the symbol is used for the plain text letter M. OK, so the author of the key combined both symbols. But where do “K” and “L” come from? 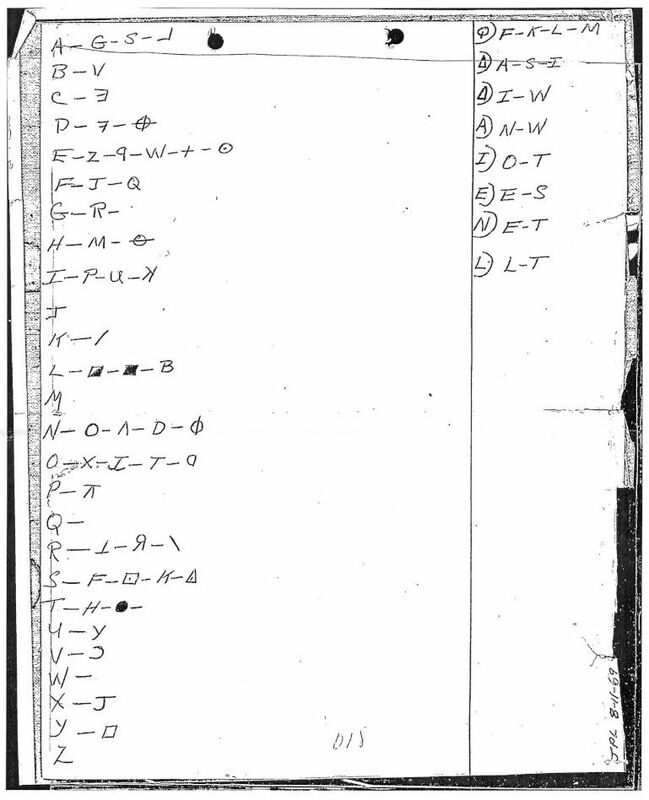 How did the key author deduce those from the Hardens’ plaintext solution? 2) Let’s say the key was sent by the Hardens. Well, why would they send a card asking to remain anonymous, a day after their names are already published in the newspapers? Also, the “K” and “L” problem still exists. 3) Let’s say the key was sent by the Zodiac killer. Shouldn’t he have been frustrated that someone solved his puzzle so soon? If he didn’t know about the published solution, why could he only wait a week before spilling the beans? Still, the card shows a few Zodiac-like qualities: the misspellings, similar use of the FDR stamp, saying he wouldn’t give his name, and the use of the word “citizen” (Zodiac used the word in the 1974 “Badlands” letter). If it was him, maybe he was just trying to refine the Hardens’ solution. 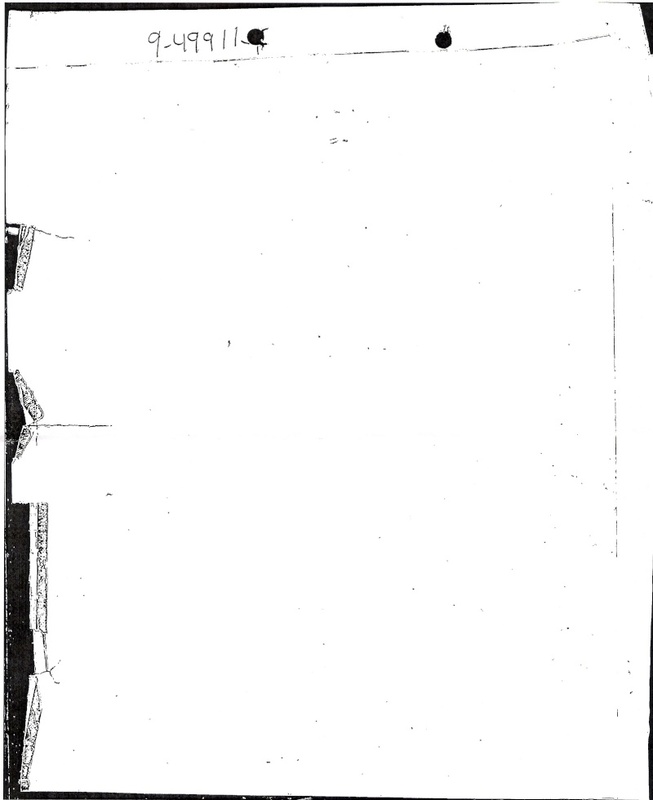 Morf received two blank sheets (one | two) bearing only the case file number, 9-49911-1. What was on those pages? Who do you think the “concerned citizen” is? Credit to smithy for recently sparking this discussion, morf for obtaining the key via relentless FOIA requests, Zamantha for supplying some of the newspaper clippings, and ZodiacKillerFacts.com and ZodiacKiller.com for a lot of the reference material. The letters D & G matches almost perfectly to Hardens, but some samples of the K letter were made by 3 strokes (this was supposed to be a ZK rare handwriting feature). I wonder if the Zodiac read the solution first on the paper and mimic or copy some Hardens letters to mislead the investigation, i´m quite intrigued! and i agree to be inconclusive. Autor, give me please your e-mail or write me on e-mail, if you can help me with one important Zodiac idea. Based on who i personally think the Zodiac was, the clue to who the Concerened Citizen was is in the word Citizen. I have believed for a long time that Larry Kane was the Zodiac, and the Concerned Citizen was in fact, Citizen Kane. We know Zodiac loved leaving playing games with thoes that pursued him, and the ‘Citizen’ clue, as in Citizen Kane, probably gave him a lot of amusement at how stupid the police were for not putting it all together. The letters on the right of the line are the “polyphones” right? Which is what scares me about the 340. If this key really IS from “The Zodiac” of course. 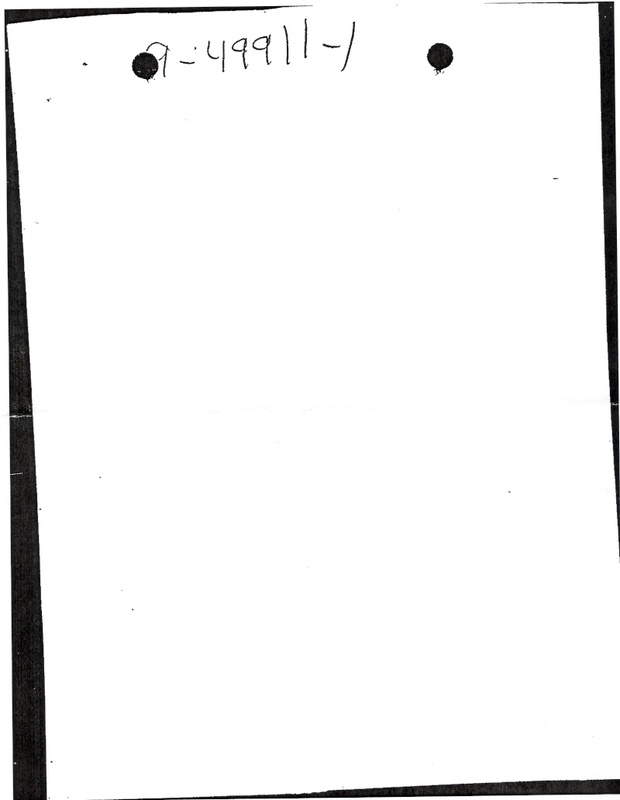 In respect to the two blank pages – I’d guess the second is the reverse of the key page, above. (Judging by the holes in it, and it’s edge.) The other? No idea. Yes, they are the polyphones. But it’s not clear that they aren’t simply due to transcription errors, since they involve symbols that are very similar to each other. Click the superscripts here to see the breakdown of errors resulting in polyalphabetic substitution. Of course, he could have introduced those errors on purpose. Of great interest to me are the odd differences between the Concerned Citizen key and the Harden key. For instance, in the former, L maps to L and T but I can’t figure out why. Similarly, why are K and L included in the mapping for Q?